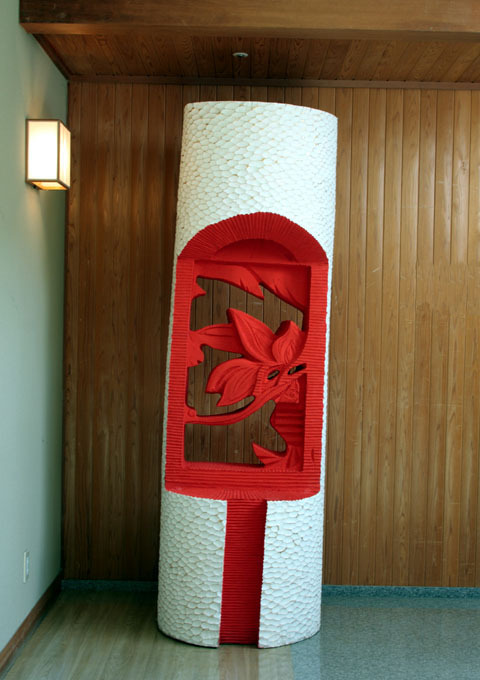 I used Chinese traditional motif of plants in my sculpture. And it tells us that one tradition have influenced to nowdays. So it looks that the shape pf both side is same, but the expression of inside id different. I use 3 colors, red, white ,gold those 3color connect each other, and attracts eyes of people. I took care of the surface of my work to express beauty. The window of my work expresses bridge for another countries and exchange, the space which I made in that window broads and connect with its circumstance. My sculpture has very celebration meaning.